Hey there daddy-o, welcome back from holiday break! 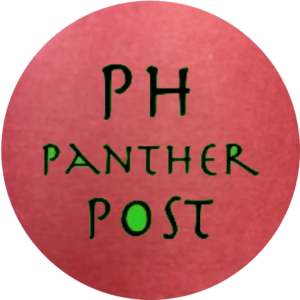 We are 7 weeks out from the she super-secret Park Hill Auction…. shhhhhh! 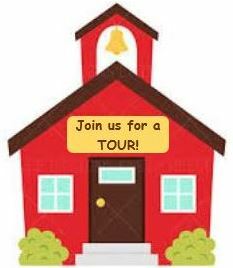 Save the Date for FRIDAY, February 22 at 6:30 pm! 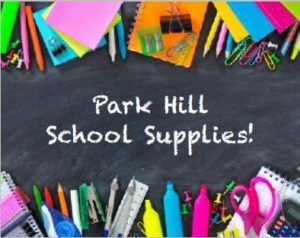 This is a free, adult only event that benefits Park Hill Elementary. Admission includes one complimentary bevy! Don’t be a wet blanket this year and dress in a spiffy ”Roaring 20’s” costume! Bring lots of clams because there will be many hotsy-totsy items up for grabs. Visit iheartparkhill.com for donation information, our Auction101 handbook and more details on the super-secret speakeasy. One of the main goals of Physical Education is to encourage kids to be Fit for Life! Children need 60 minutes of moderate to vigorous physical activity every day to be healthy. Unfortunately, students do not get that opportunity at school every day, so they need to be active outside of school. Also, children are developing habits now that can last a lifetime. 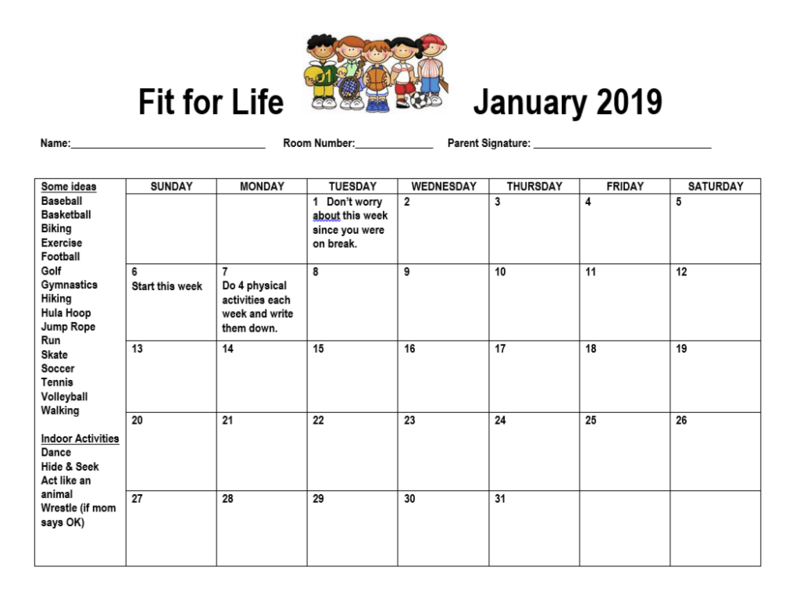 Each month (January to March), your child (1st to 5th grade) can bring home a Fit for Life calendar from PE. On the calendar, your child can keep a record of physical activities outside of school. They are able to fill in each day’s box with an activity. There are outdoor and indoor physical activity ideas listed on the calendar, but any moderate to vigorous physical activity is great! The children are to return the calendar at the end of the month with their name, their teacher, and your signature. Students who bring the calendar back completed with at least four activities each week will be members of the Fit for Life Club and get a small prize. 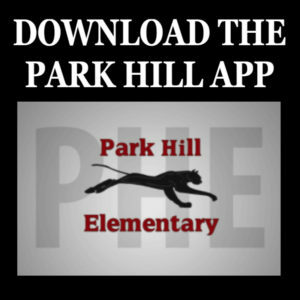 Thank you for helping your children at Park Hill become FIT for Life! Uno de los principales objetivos de la educación física es animar a los niños para que estén en forma para toda vida. Los niños necesitan 60 minutos diarios de actividad física de moderada a vigorosa para ser saludables. Desafortunadamente, los estudiantes no tienen esta oportunidad en la escuela todos los días, así que necesitan estar activos fuera de la escuela. Además, desarrollan hábitos que perduran en el tiempo. Cada mes, su hijo llevará a casa un calendario sobre “En forma para toda la vida” de educación física. En el calendario, su hijo puede llevar un registro de las actividades físicas/deportivas que practica fuera de la escuela. Su hijo puede llenar una casilla del calendario a diario con una actividad. En el calendario se indican actividades físicas en espacios interiores y exteriores, pero ¡realizar cualquier actividad física moderada o vigorosa es fabuloso! Los niños deben entregar el calendario al final del mes con su nombre, número de salón de clase y la firma del padre. Los niños que traigan el calendario completo con al menos cuatro actividades cada semana pasarán a ser miembros del club “En forma para toda la vida” y ganarán un pequeño premio. Gracias por apoyar a sus hijos en Park Hill para que estén en forma para toda la vida. Do you ever feel overwhelmed? Short tempered with your kids and family? Feel like you could use a mental spa day? If you could use Mindfulness (AND MUCH MORE! ), our Mindfulness Monday Instructor, Liz Rutledge, and her friend Cyrina Bullard, are running an awesome event THIS Saturday afternoon (January 12, 2019). They will be providing resilience, mindfulness and happiness tools to help you be able to respond to life’s inevitable challenges with more regard to yourself and others.